Freezer meals are my go to lately. My father had surgery last month and I stocked up my parent's freezer with these easy to make meals. Now with it being moving week here we are eating up our supply and it saves me so much time and cleaning! This Honey Garlic Pork freezer meal is all prepped and ready to go with boneless pork and chopped sweet potatoes and apples mixed with honey and garlic sealed in a freezer bag. Just defrost overnight then pour into your Crock-Pot in the morning. Cook it on low and it is ready is 6-8 hours. Easy-peasy and just what this busy Mama and her family wants for dinner! Check out my newest cooking video here! Add all ingredients to a large freezer ziptop bag. When ready to use, defrost the bag overnight then dump the contents right into the Crock-Pot. Cover and cook on low for 6-8 hrs. When ready to use, defrost the bag overnight. Add the contents of the bag right into the Crock-Pot and cook on low for 6-8 hours. The pork juices will make their own sauce with the honey and garlic. The apples with cook down too into soft almost applesauce consistency. Sometimes I peel them since they are so soft. 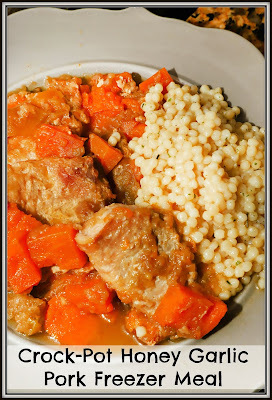 Serve with rice, couscous, or a steamed green veggie. Dinner is served! No mess to clean and no time spent cooking tonight! 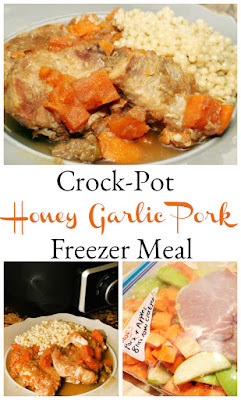 I love the convenience of this freezer meal and the combination of pork with garlic and other ingredients sounds like a delicious dinner; winner-winner!